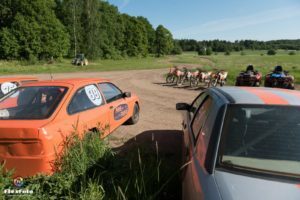 Try the ‘Pois Tieltä!’ rally experience. Take your company’s clients or staff to the wild world of rally. Rally is available year-round on a track of approximately one kilometre. It has plenty of tight turns. The team can compare their skills by timing their turns. The driving events are held in Lohja, about an hour’s drive from Helsinki, Espoo and Vantaa. The experience is equally well suited to a first-timer as it is to a seasoned rally driver. The event always includes careful training, so even inexperienced drivers can safely enjoy the thrill of speed. The rally Sierras at your disposal have been tuned up in ‘Pois tieltä!’s own workshop. 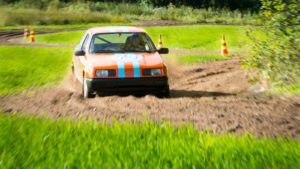 In addition to normal rally cars, you can test a ‘different’ rally experience with reverse cars that turn in the opposite direction of how the steering wheel is turned. The rally experience for the business event is completed with our meetings and party services. You can relax in a sauna, dine or use meeting rooms according to your needs. Depending on the winter weather, there is also an ice track, but rally is a great experience all year long. You can also order a rally school lesson in the beginning if rear-wheel driving doesn’t come to you automatically. At the rally school, the trainer is in the co-driver’s seat and gives the driver instructions at every turn. Before driving, we always go through the vehicle’s driving techniques and safety issues. At the same time, we familiarise ourselves with the car’s controls. ‘Pois Tieltä!’ provides the drivers with the appropriate gear! ‘Pois Tieltä!’ plans your perfect rally driving day with you. You can order meals and sauna, campfire coffee and grill sausages. We also arrange the necessary meeting facilities, accommodation and transportation to the safari terrain. Together we’ll plan a rally event that meets your wishes. The group size is about twelve. There are 2-3 cars.